The best-known variety of mole, the mole poblano, is often considered Mexico’s national dish. The soft brown sauce contains more than 20 different ingredients, including chocolate and chili peppers. The result is a subtly sweet yet spicy topping that can be served on a variety of items such as chicken, pork, turkey or, most notably at the restaurant Mole Poblano, inside tamales. 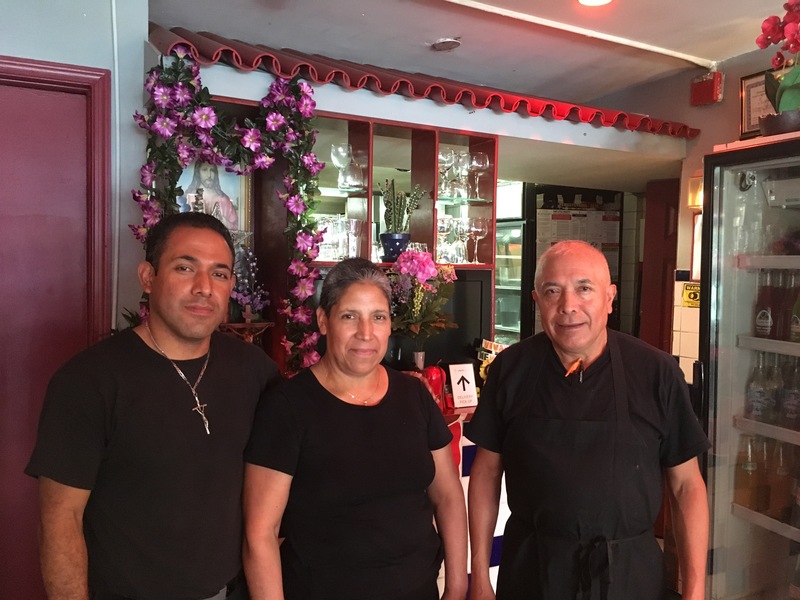 “Tamales are one of our most popular dishes,” said Ines Sandoval Perez, who co-owns the restaurant with her husband Pedro Rios Hernandez. Each week, Rios, who serve as Mole Poblano’s executive chef, prepares a large vat of masa, a corn flour dough mixed with lard and seasonings, to fill the 250 or so tamales that the restaurant serves every weekend. Rios places a generous scoop of masa inside the cornhusk wrapper of each tamale, then pours on a sauce (either mole poblano, salsa verde, or salsa roja). Finally, he adds the meat (pork, chicken or vegetables) to finish off the dish. The result is a wonderfully rich combination of flavor. Rios, a Puebla native, got his start cooking shortly after he arrived in Philadelphia about 20 years ago. After suffering through hard work in a factory in the area, he and his wife decided to start their own business from home by cooking Mexican classics, such as tamales, tacos de carnitas and cactus, quesadillas de tinga, tortas and steaks. They initially sold their plates to la Jarochita, a food store deep in South Philly, as well as to Mexican immigrants who worked at car washes and a meat packing plant. The food caught on within Philadelphia’s Mexican community. Soon, the duo started going around to Center City restaurants, such as Amada, to sell their food to Latino workers during their lunch breaks. Today, Mole Poblano boasts an impressively large Mexican menu serving everything from breakfast dishes like Huevos Rancheros to quesadillas, tacos, tortas, enchiladas, steaks and seafood platters. In Mexico, comida corrida refers to a set menu or several courses for a fixed price. At Mole Poblano, for $12.96, the menu includes a drink and chips with pico de gallo, cream and salsa verde and roja, followed by a main course (selected from three options), a soup and a dessert. Among the smorgasbord of tasty choices on the menu, the Molcajete dish stands out for both its rich flavor and unique presentation. The unusual name comes from the Nahuatl word for mortar - the black circular basin used to grind food. Inside the molcajete is grilled chicken, steak, queso fresco, cactus and onion all placed on top of a rich sofrito sauce below. The massive dish is meant for two people so bring a friend. For more information about Mole Poblano, check out the restaurant’s website molepoblanosouthphilly.com or Facebook page. For catering, you can order through Fooda. Hours: Monday to Friday 10 a.m. – 10 p.m., Saturday and Sunday 8 a.m. – 10 p.m. Address: 1144 S Ninth Street Philadelphia, PA 19147. Prices: $7 - $20.